Put-in-Bay Goodtime Put-in-Bays original party boat! Goodtime Cruises to the Lake Erie Islands! 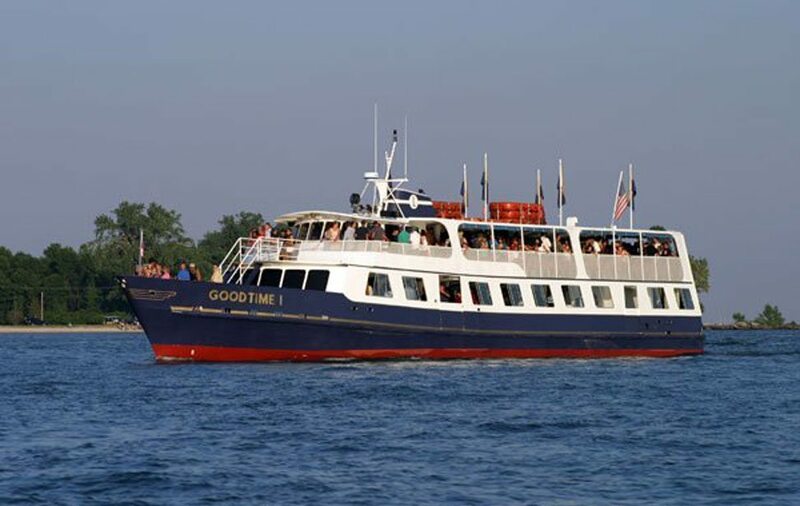 Goodtime Island Cruises offers a leisurely voyage to Put-in-Bay and Kelley’s Island. Based out of Sandusky, Ohio Goodtime has several different options for your Put-in-Bay adventure. Their primary vessel, Goodtime I, can accommodate 315 passengers and is approved by the U.S. Coast Guard. An island hopping tour offered includes spectacular views of Cedar Point, Johnson’s Island, and the Marblehead Lighthouse en route to Put-in-Bay and Kelley’s Island. Passengers can immerse themselves in the natural beauty of Lake Erie atop the open air deck and learn about Put-in-Bay History. This cruise begins boarding at 9 a.m and concludes around 6:30, with 3 and a half hours spent sightseeing on Put-in-Bay. This island hopping cruise has a relaxed pace and great for families to explore the Lake Erie Islands. For a more adult-oriented cruise Goodtime offers their Friday night voyage also referred to as the “Booze Cruise.” These trips range from Labor Day and Memorial Day and offer service from Sandusky to Kelley’s Island. Additionally, groups, parties, and fundraisers can charter the Goodtime I for their own Put-in-Bay and Lake Erie Islands adventure. The picturesque setting and tranquil environment make Good Times Island Cruises a fun way to explore Put-in-Bay. Random Fact: Lake Erie is the tenth largest lake on Earth and, of the five Great Lakes of North America, it is the fourth largest by surface area, the southernmost, shallowest, and smallest by volume. It is bounded on the north by the Canadian province of Ontario, on the south by the U.S. states of Ohio, Pennsylvania, and New York, and on the west by the state of Michigan.